AUSTIN, Texas, February 1, 2016 (ENS) – An international team of scientists will begin a two-month journey to Antarctica on Tuesday to search for dinosaur fossils. They hope to find evidence that the frozen continent may have been the starting point for several vertebrate species that roam the Earth today. Millions of years ago Antarctica was a warm environment dominated by dinosaurs and inhabited by many other species. Today, the fossilized bones they left behind could reveal what prehistoric life was like, but they are buried under the icy landscape. Leading the 12-person team are paleontologists from the Carnegie Museum of Natural History, the University of Texas at Austin, Ohio University and the American Museum of Natural History. Other collaborators include scientists from museums and universities across the United States, Australia and South Africa. With the help of helicopters, scientists will conduct research on James Ross Island and other nearby islands off the tip of the Antarctic Peninsula, one of the few spots on Antarctica where fossil-bearing rocks are accessible. The team is searching for fossils from the Cretaceous through Paleogene, a period about 100 million to 40 million years ago that includes the end of the Age of Dinosaurs and the beginning of the Age of Mammals. The team hopes to answer the question of whether Antarctica played a critical part in the origins of certain modern bird and mammal groups, or if the evolution of species there was more similar to what was happening in other parts of the world. “Australia was connected to Antarctica right through the Age of Dinosaurs and beyond, up until about 40 million years ago,” said team member Dr. Steve Salisbury, a paleontologist in the University of Queensland School of Biological Sciences. “Antarctica holds the key to a lot of biogeographic problems that we’re trying unravel with regard to how dinosaurs and various other creatures ended up around the globe,” he said. Salisbury said the team hopes to find new evidence to indicate what dinosaurs may have existed in Australia, and how those already found in Australia might relate to their counterparts in Antarctica and other parts of once great southern supercontinent, Gondwana. The expedition is part of the Antarctic Peninsula Paleontology Project, or AP3, a research initiative funded by the U.S. National Science Foundation. During a previous expedition to the same area by Argentine investigators, a fossil of a new genus and species of bird was discovered that indicates Antarctica may have been an especially important place for bird evolution. The bird, a close relative of modern ducks and geese, is the only known example of a bird belonging to a modern group that lived alongside nonavian dinosaurs. Before the discovery, many scientists thought that most modern bird groups evolved after nonavian dinosaurs went extinct. “It’s impossible not to be excited to reach remote sites via helicopter and icebreaker to look for dinosaurs and other life forms from over 66 million years ago,” said Julia Clarke, a professor and paleontologist at the UT Austin Jackson School of Geosciences who led the research on the new bird species. Ross MacPhee, a curator and professor at the American Museum of Natural History, will also be returning to the continent. 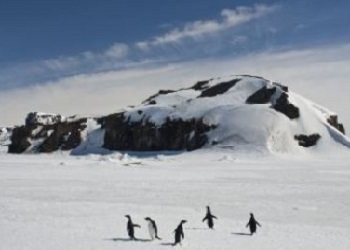 “What I hope to achieve this time is to discover the first evidence of mammals in the Cretaceous of Antarctica, species that lived at the end of the Age of Dinosaurs,” MacPhee said. In addition to paleontologists, the research team includes geologists who will survey the fossil-bearing rocks to help decipher what the Antarctic environment was like at the end of the Cretaceous and the beginning of the Paleogene. During an expedition in 2011, Eric Roberts, a geologist from James Cook University in Australia, discovered evidence that the rocks on Vega Island may date to the Cretaceous-Paleogene boundary. 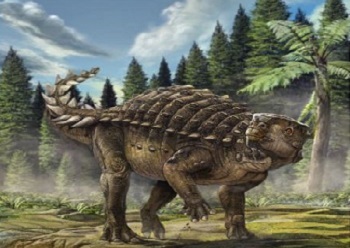 If so, it would be one of the few Antarctic examples of rocks laid down during the time of the asteroid impact 66 million years ago that killed all nonavian dinosaurs. The team will be using the U.S. research vessel R/V Nathaniel B. Palmer to reach the James Ross Island area. The scientists will share their discoveries and daily life on the Antarctic ice on the expedition websiteand on Twitter @antarcticdinos.